The UK government issues public health advice about how much booze people ought to consume. It has recently revised those guidelines. The previous guidelines were the subject of this SK.SE question: Recommended alcohol drinking quantity: are they just making it up? The answers hint that there was not enough evidence to come up with clear guidance but that guidance was issued anyway. This time the 2016 advice claims to have been based on more robust evidence. Civil servant Dame Sally Davies has drawn up the lowest recommendations in the West: there is no “safe drinking level”, her team declared. The question is what justification was used to get there. The answer isn’t pretty for “evidence based” policy. Repeated studies have shown that alcohol in moderation prolongs life: it reduces the risk of heart disease and strokes. In fact the benefits of alcohol in preventing strokes and heart disease are far clearer than the negatives of drinking. So are the new guidelines robustly evidence based? That is, a 1% lifetime risk of dying of an alcohol-related condition, including accident and injury due to drinking, as well as alcohol-related medical conditions like liver failure and oesophageal cancer. If you're happier to accept a higher lifetime risk than 1%, or if you think the differences between men and women might be significant, then you can look at the CMO's report to get the extra detail. Or you could just ignore the guidelines and carry on drinking as you were—it's just a guideline, not the law. The criticism made by the Register is based on a confusion between two uses of the word "safe". When the Chief Medical Officer says that there is no "safe" level of alcohol consumption, she means that there is no level of drinking at which the risk of dying from an alcohol-related condition goes to zero. Whereas the Register is using "safe" to mean the level at which the harm due to drinking is balanced by the benefits. Note that the protective effect of moderate consumption of alcohol is discussed in detail in the CMO's report (see pages 14–19). The key data inputs into SAPM are baseline levels of current UK alcohol consumption, current levels of alcohol-related mortality and morbidity (defined as person-specific hospital admissions) and, most importantly, international and UK-specific evidence relating different levels and patterns of alcohol consumption to risk of mortality or morbidity from 43 health conditions causally related to alcohol consumption. This evidence is taken from a combination of published meta-analyses of risk relationships, analyses of the proportion of cases of alcohol-related conditions attributable to alcohol and UK mortality and morbidity rates for the 43 conditions. The model and its inputs are described in detail in section 3 of the Sheffield report. Take a look and see if the approach makes sense to you. A comment points to this article by Adam Jacobs ("The Stats Guy") as a criticism. Unfortunately, Jacobs misunderstood the figures in the Sheffield report, and so much of his criticism is nonsensical. Consider figure 11 from the Sheffield report. This graph plots lifetime risk of hospitalization due to an alcohol-related cause, relative to someone who does not drink, against peak day alcohol consumption. 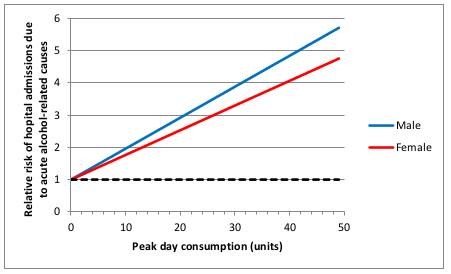 Hence the relative risk is 1.0 when peak consumption is 0. But Jacobs describes this as "how many times more likely you are to be admitted to hospital for an alcohol-related cause than you are on a day when you drink no alcohol at all". I think the confusion here must be over "alcohol-related cause". The Sheffield group uses this to mean "a condition that can be caused by alcohol"—the point being that you can still be hospitalized for liver cirrhosis even if you have never drunk alcohol (liver cirrhosis has multiple causes). Whereas Jacobs seems to understand this as "a condition definitely known to have been caused by alcohol" and then struggles to find an interpretation of the graph that would make this work (because non-drinkers can't be hospitalized for such a condition, and so there would be no base rate to derive a relative risk from). The Sheffield report could have done a better job of explaining this. Not the answer you're looking for? Browse other questions tagged alcohol united-kingdom public-health .